Ensure you have everything under control with our control unit. Connections to smart backend systems allow consumption and costs to be displayed, processed and evaluated. Invoice accounting is also possible. Many wallbe products are already equipped with the necessary technology for data exchange and control, so users and operators can carry out management and administrative tasks with the help of a comprehensive all-round solution. wallbe’s smart load/charge management ensures that optimum use is made of the local charging network load. Load peaks are prevented and charging power prioritised in accordance with defined rules. Regenerative energy sources, such as your own photovoltaic system, can also be integrated in the system. Smart distribution to active charging stations reduces high energy costs at peak load times. The load/charge management system is either integrated directly in the charging stations or housed in a separate control console. Open Charge Point Protocol (OCPP for short) enables communication between wallbe charging stations and management systems, allowing back-end applications and accounting systems to be integrated in the charging infrastructure. This universal protocol ensures the sustainable operation of charging networks and the trouble-free integration of new charging points. wallbe solutions support OCPP 1.5 and 1.6, so they are suitable for the globally standardised communication between charging points and charging infrastructures. 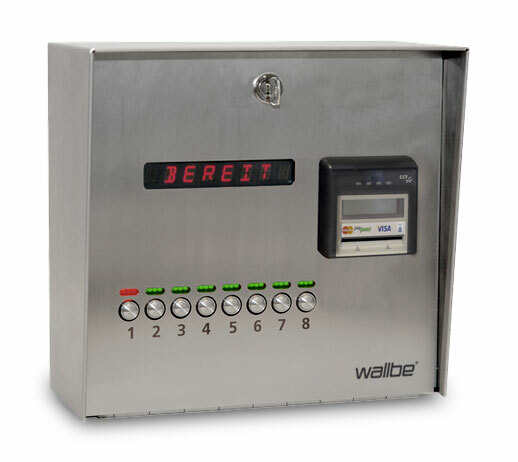 wallbe accounting simplifies matters when direct payment is required. Various models with payment by cash and card are available. Pay4Charge, which takes payment rates according to charging performance into account, is suitable for indoor and outdoor use. Besides conventional methods of payment, RFID-based accounting is also possible, provided that cost centres are defined in the system. Pay4Charge supports all common payment systems and therefore facilitates the entire payment management process for a charging solution.